MOOMIN - a worldwide success! The Moomins, created by Tove and Lars Jansson, are internationally recognized as having a unique artistic and literary dimension. Aimed largely at a young readership the books feature trolls and a vast gallery of other non-human characters, each one reflecting a specific human type, living a secluded life in the midst of disasters such as floods, storms and comets. The many adventures and subsequent resolutions stress important family values and individual qualities of kindness, self-confidence and independence. Tove Jansson began writing about the Moomins in the 1940’s. Today her books have been translated into 49 languages and have appeared in many different media: theatre, opera, ballet, newspapers, film, radio, television and multimedia. 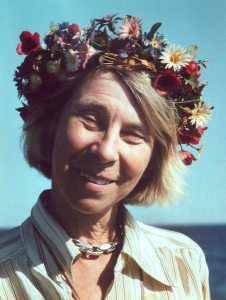 Tove Jansson, the Finnish painter, artist and writer was born on August 9th 1914 in Helsinki. A daughter of artist parents, sculptor Victor Jansson and designer Signe Hammarsten Jansson, she naturally took to a career in art. But her creative ambitions also included writing and as i turned out, Tove Jansson became as successful a writer as an artist. The first of her novels, “The Little Trolls and the Great Flood”, was published in 1945. She continued in the same vein of illustrated books starring the Moomin family and her real breakthrough as an author came in 1948 wth “Finn Family Moomintroll”. It med withe immediate acclaim and was quickly translated into English, leading to an international success of the Moomin books. In 1953, Associated Newspapers of London contacted Tove Jansson asking her to do a Moomin strip cartoon to be published in the Evening News, the world’s largest evening newspaper. The Moomin strip started in the Evening News in 1954 and two years later, Associated Newspapers launched an international syndication drive, which ultimately resulted in the strip being published in several languages with a readership of 20 million daily. All the while Tove Jansson continued writing and illustrating Moomin books, and receiving awards for her exceptionally fine work, both as an artist and writer. Please visit All things Moomin for more facts about Tove Jansson and the Moomins. Moomin Characters Oy Ltd. is the official body responsible for Moomin copyright supervision. Tove Jansson and her brother Lars Jansson founded their family company in 1958 and a limited liability company, Moomin Characters Oy Ltd. Was established in 1979. Even today the company is run by family members. Sophia Jansson, Lars’s daughter and Tove’s niece, is Chairman of the Board and Creative Director at Moomin Characters. All characters from Moomin Valley are registered trademarks.